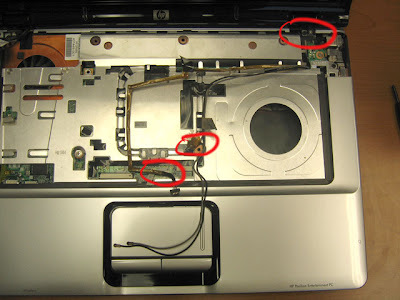 HP DV6000, DV9000, DV2000, and Compaq v3000, v6000 Disassembly Tear-Down with photos. 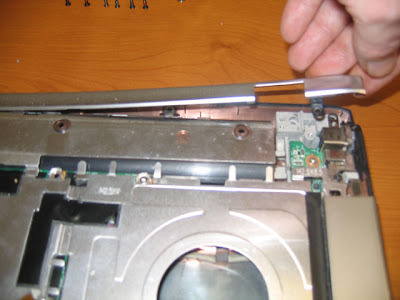 Now Available a PDF Download an AD FREE and Printable 3$ dollar file of this DV6000 Tear Down guide, all for less than a cup of coffee at Starbucks ;). 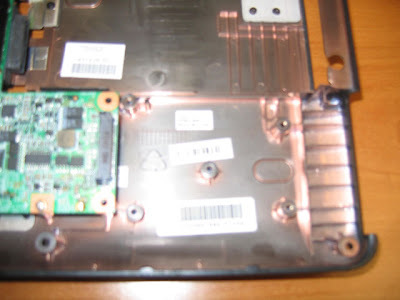 This is a quick post showing a DV6000 tear-down. What is needed: Clean Space to work you should have an anti-static mat and wrist strap as well. Now That you have removed all of the screws on the bottom that will release the top case from the chassis you will need to remove the bezel holding the quick launch buttons and the power button ... the keyboard and the LCD ..
Pry (very carefully) one side of the bezel up this will release the rest of it. 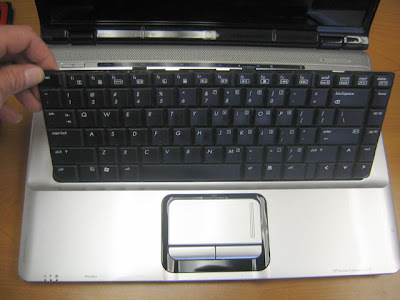 This will let you lift the keyboard up and back on its self. 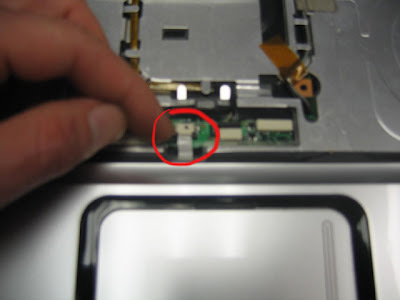 Once the keyboard is resting on the touchpad unclip the ribbon cable from the system board and place the keyboard off to the side. 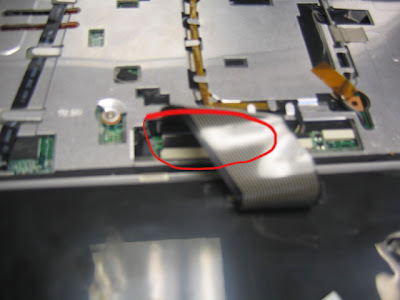 There is another ribbon cable for the touch pad that will also need to be disconnected. Now that the Ribbon cables have been released you can remove the last little cable from the bezel going to the LCD panel and place the bezel off to the side. on the left side you can now remove the black screw holding the left side of the LCD panel ... the silver screw next to it can be left in ..
Before removing the screw on the right side for the LCD panel remove the cables from their keepers so they are free and clear when you lift up on the LCD panel... the Wi-Fi cables will need to be pulled up through the system board from the bottom where they were attached to the wireless card ... and the cable attached to the system board should be easily disconected with a very small flat head screw driver be very careful not to damage the connector or the cable. 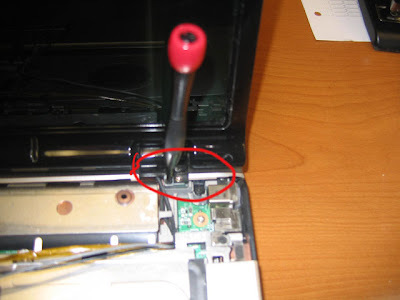 Now you can remove the remaining black screw that is holding the LCD panel in place ... carefully lift the panel up taking care with the cables still attached making sure they are free and put the panel in a safe place till you need to put it back on. 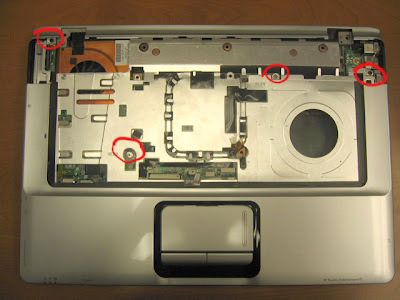 Now that the Quick Launch bezel, keyboard, and LCD panel have been removed you can see the 4 screws left that can be removed for the top case... but don't try to take the top case off just yet. 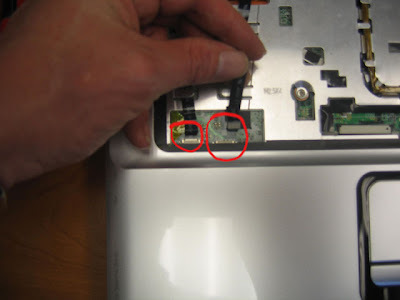 There is a small plastic bezel that was hidden under the LCD panel that needs to be removed first the retaining screw is hidden by the power plug remove the screw and pry up the bezel. Lift the bezel off and place that to the side. Now you can remove the top cover ... you will need to either use a plastic spuger or your finger nail to release the small clips around the edges to lift up on the top cover. Just go around all of the edges and they will easily release. 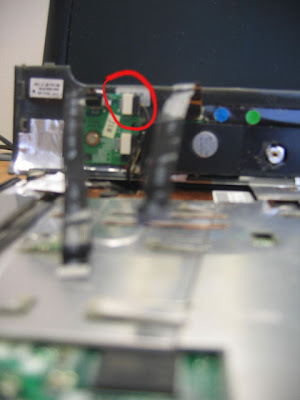 Now finally you have access to the system board... there are 5 screws left to remove 4 of them are holding down the PCMCIA card cage and the last one on the lower right side of the system board hold the system board to the lower case. 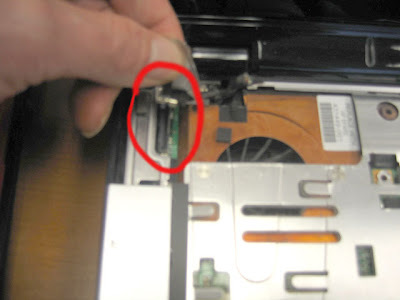 Showing the PCMCIA card cage removed. And the PCMCIA card cage and the screws..
After the cable on the front has been disconnected ... here is the tricky part... the system board is free to come out .. but you will have to gently pry the left side away from the system board ... gently rocking the system board back and forth to free it from the bottom case ... gently pry away the plastic areas next to the usb, firewire, and the s-video connector the system board will eventually come free. Remember the power cables are still connected so do not just yank it out. 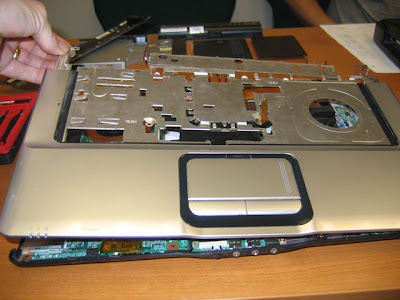 Carefully flip the system board over ... and TADA.... all you have to do is remove the power cables .. and its out .. your done..
Re-assembly is just the reverse of taking it apart... hope this helps in any and all endeavors you may be seeking. 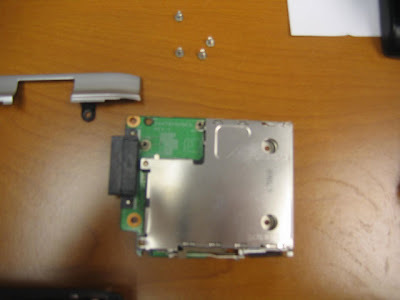 First make sure acpi/video module is loaded correctly. Thanks for the great detail, was easy to follow. 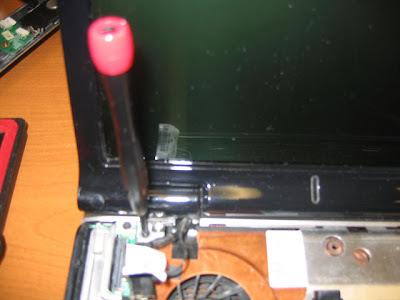 Unfortunately after reassembly the screen now stays blank after power-on. Any help appreciated. Great guide. My dv6000 was making an awful whining sound from the cooling fan. 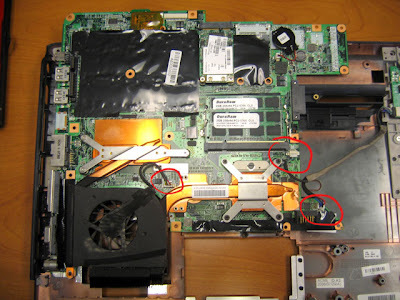 I followed this guide, then removed the fan from the mainboard. Next, I disassembled the actual fan and removed the blade from the motor (it's held on by magnets and can be pulled off easily). I noticed worn spots on the tips of the blades so I filed the blades just a bit. Reassembled, and it works sans horrible whine! Hey, thanks alot! That crudded-up fan sure was a devil to get to! THANK YOU FOR TAKING THE TIME TO DO THIS...VERY APPRECIATED. MILWAUKEE, WISCOSIN!!! I am not sure what problems would be caused by putting the cables in incorrectly. But it could have taken something else out on the system board.. and you may have to replace that. 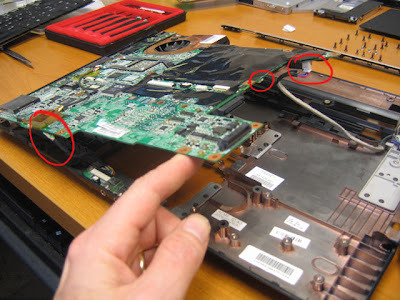 Other wise from what you are telling me with the system not doing anything double check all of your connections .. if you have the systemboard out entirely try it with the battery not other power and only connect either the power button or the quick lauch .. and try that. 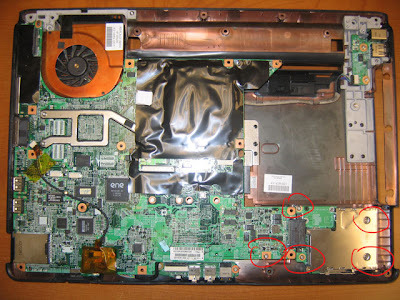 This could be a symptom of the video chip BGA separating from the system board as well. I please you to help me! 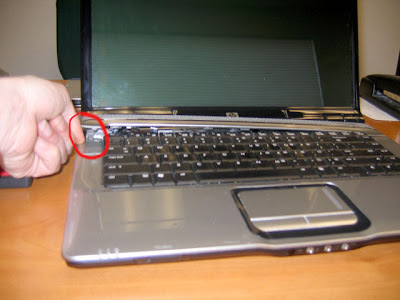 I've got an hp-dv6000 and some days ago it decide to stop working. 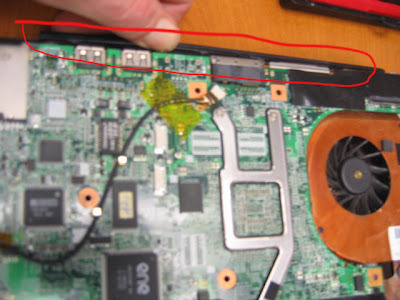 I've opened it and found the problem, on the mobo the chip near the battery plug is totaly burn up! 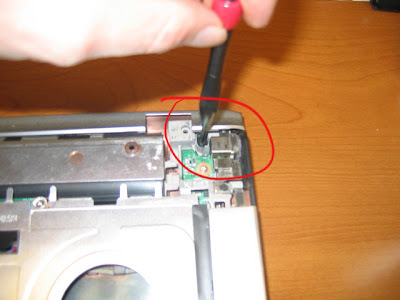 can you please send me the name of that component, or better way, a photo when i can read the full name?